A more glorious summer night could not be wished for, as the warm sun starts to descend in the sky, birds whistle all around, and chattering theatre-goers eagerly tuck into their picnic hampers, dreamily waiting for the premiere performance of The Secret Garden at the Grosvenor Park Open Air Theatre to begin. Now in its fourth year, the theatre company’s Artistic Director, Alex Clifton, couldn’t be happier with the beautiful location of what has to be the finest open air theatre outside of London, quite rightly describing the park as “our very own magic garden.” The last of the sunlight falls, as if directed to do so, onto a William Morris-style tapestry curtain adorned with a golden tree and colourful songbirds. Then, as silence falls, the curtain is parted and the magic of France Hodgson Burnett’s timeless children’s story comes to life. The tale follows Mary Lennox, an ill-tempered and haughty little girl living in India during the British Raj, who suddenly finds herself shipped off to England after the death of her cold and distant parents. Ending up in Misselthwaite Manor, the home of her brooding uncle, Archibald Crane, amid the totally alien landscape of the Yorkshire moors, the unlikely heroine is left to her own devices. She begins to explore the house, with its many locked doors, and slowly makes discoveries that will lead her to unravel the mysteries of a secret garden, and in so doing will forever change her life, and those of all the Manor’s inhabitants, for the better. By far one of the most standout aspects of the play is the veritable menagerie of wonderful animal puppets designed and directed by the talented Toby Olié. 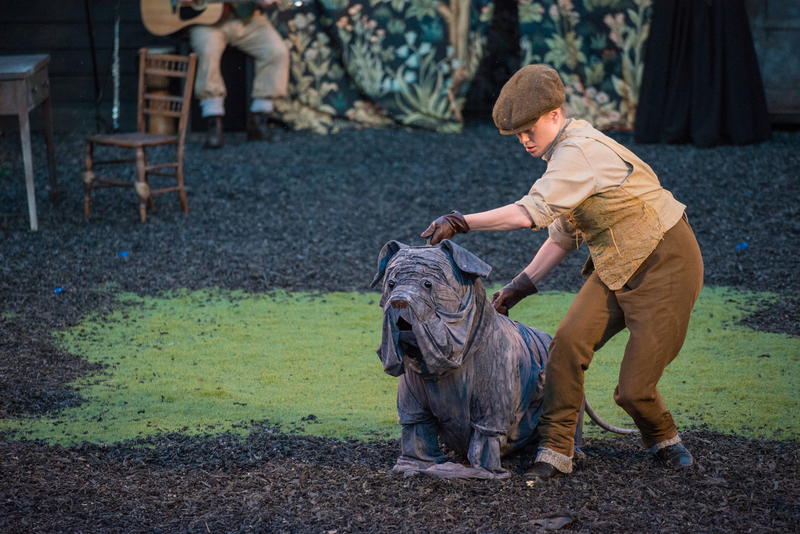 From the menacing dog of Mary’s uncle to the friendly robin that flits through the air and helps her to rediscover the long hidden garden – plus a whole host of other wonderful creatures in between – the rustic and charming puppet cast does not fail to delight as it is animated by actors attired in flat caps and waistcoats, appropriately christened “the Secret Gardeners”. Olié, who not only had to design puppets that could potentially withstand the very worst of the British weather, but also had to make sure that each puppet could be seen by the whole audience and was not being blocked by its puppeteer (a fair challenge in a 360̊ stage space), has succeeded in creating a truly magical and heartwarming display of puppetry. The whole cast – dressed in beautiful period costume designed by Jessica Curtis – provides a strong performance, with many of its members playing a number of different roles, as well as providing musical accompaniment on fiddle, accordion, drum and tin whistle. Actress Jessica Clark effortlessly portrays young Mary’s transformation from sour, “little crab apple” to joyous and kindhearted, little girl. Scenes featuring Yorkshire maid, Martha, (played by Kathryn Delaney) as well as actor Gareth Williams’s gruff gardener, Ben Weatherstaff, are the source of plenty of warm Northern humour. One notably striking scene, with excellent music by Sarah Travis, has characters dancing and chanting a spell to call home the far-wandering Mr Craven, as puppet animals gather excitedly around, and is undoubtedly one of the highlights of the play as a whole. The aesthetic of the performance focuses strongly on the notion of nature’s resurgence, and the secret garden’s rejuvenation closely reflects that of the characters tending to it. Commonplace, man-made objects are whimsically transformed into natural wonders, as ladders become the trunks of trees and delicate lace parasols transform into green foliage and blooming purple flowers. By the second half, as life in the garden stirs once again, a spreading patch of grass appears in the centre of the performance space, as if from nowhere. By the final act, even a wardrobe has burst open to reveal a dazzling array of flowers emerging from inside. The piece emphasises half-explored themes of prejudice within the original story, whether it concerns class, race or gender. The words of Mrs Lennox as she scolds her daughter’s “filthy native” Ayah in India, are repeated by Mary herself when she first meets her new maidservant, Martha, in Yorkshire. These obstacles are later overcome, however, as Mary goes on to befriend Martha and her animal charmer brother, Dickon. The addition into the plot of a modern-thinking, perceptive, female doctor who treats Mr Craven’s spine curvature abroad contrasts starkly against the thoroughly Victorian male doctor back at Misselthwaite Manor, whose supposed treatment of sickly, young invalid Colin Craven is laced with a sinister ulterior motive. In response to Craven’s remarks that she is a truly “remarkable woman”, she assuredly corrects him by explaining that she is, in fact, “a remarkable doctor." The Secret Garden is a fabulous adaption of a much-loved classic, that stays true to the original story’s messages of kindness and healing magic within us all, and is sure to be enjoyed by children and big children alike! 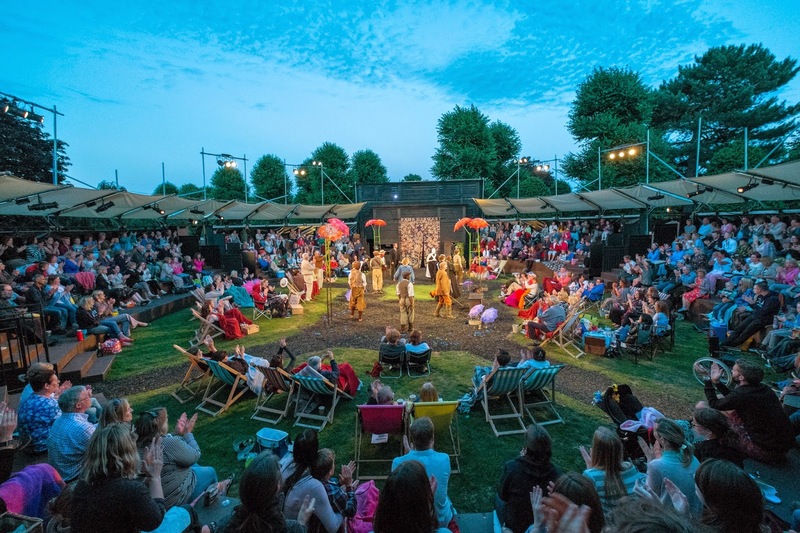 The Grosvenor Open Air Theatre runs until 24th August, and is also currently staging Macbeth and The Comedy of Errors. I’d really like some theatre reviews (and more arts articles in general) so was wondering if you might have a look around.